Home Tags Posts tagged with "Gina Abelkop"
Marina Diamandis introduces us to her new album, Froot, with an interview that includes the above snippet, but then shares with us songs that include lines like “Nature ain’t a fruit machine/She’s gotta keep her credits clean” and “Leave it too long I’ll go rot/Like an apple you forgot/Birds and worms will come for me/the cycle of life is incomplete” and “everybody dies (dies)” trilled in a high, shiny, minor key (which reminds me of the totally sick and funny “Super! Super! Super! Suicidal” cheerleader-chant from her last album, Electra Heart). Which is not to say that Marina has not actually experienced a profound change in way she moves through the world, but instead sneakily highlights the idea that newly-felt states of understanding/living do not necessitate one forgetting or disregarding our mortality, fear, sadness, desolation, anger, etc. Pop music is such a perfect way to play in all this big-time glitter and death muck, particularly the kind of pop music Marina makes which is majorly baroque, rococo, melodramatic, theatric, and glam, not to mention extremely beautiful and playful and sly, uniquely binding those qualities together and then giving them classic singer/songwriter-y outlines. That pop star’s magic ability to sing out an abundance of feeling in a way that cuts right through you every single time, even though you “know” it’s “just a pop song.” (You indignantly do NOT know and there’s no “just” about it.) See: Kylie Minogue’s “The One” or the entirety of Beyoncé’s B’Day, to start. Two night after beginning this piece of writing I’m feeling some basic hysteria-lite after a few days off meds (by accident) and dealing with a year-long skin condition that is making me want to slice off my own face with a kitchen knife. Today an interview with Lana Del Rey was posted online in which she talks about a new song titled “Music to Watch Boys to” which made me think of that old “I’m a girl watcher/watching girls go by/my my my” song, the horror-accompaniment to every woman’s walk down any street lined by men (though if we’re talking about structurally perfect pop songs, it is a good one). I like the idea of Lana writing this song that flips that, that puts the leering men on the other end of the story, though I don’t think that’s how the song will actually be, will it– usually I find myself transferring my own desires onto Lana’s songs, in terms of what I want them to mean, and I’m also usually wrong. I thought “Brooklyn Baby” was totally funny and mean and sassy but then in an interview she said it was a pretty straightforward narrative of a time in her life and I was like, oh. But that didn’t make me love the song any less and I certainly didn’t lose any respect for her; she is making the art she wants to make, without me and my feminism/misandrism in mind, as everyone and anyone should. It just added to the feeling that I don’t understand who she is yet, and usually when I love a pop star it is because I think I know them, the core of them, and I love that core. But not with Lana. But also she doesn’t care. 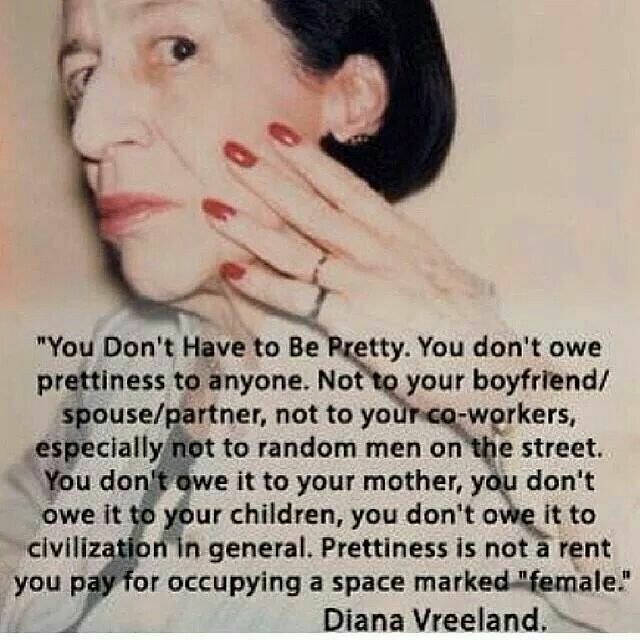 That Diana Vreeland quote about women not owing anyone prettiness was on my twitter feed the other night and I can’t stop thinking about it, as I look at my face in the mirror each morning and feel I owe it to the entire world (as if the entire world cares; but aren’t we told it does?) to make myself look as little grotesque as possible (shades of TLC’s “Unpretty”?). Lana and Kylie and Beyoncé and Marina are all so, so pretty and I’m sure they feel like they owe it to us. The thing is I like to look at them, too. I’m nauseous and light-headed and deep in the Tuesday night hysteria-lite zone and there’s not a thing in this entire world that sounds good to me tonight so I’m writing this. I am missing my friend Keith’s cheerful sensory-deprivation machine which would require that you to put on glasses and headphones which then pulsed out weird frequencies and patterns that temporarily engaged you in a weird-nothing world, so I guess there is one thing that sounds good tonight. There is a lot to be grateful for, pop music being amongst that “a lot,” and I want to mainline the essence of that, I want that perfect note sung just right over a good dance beat perma-playing in my ear, I want every new record NOW and I want my pop stars carefully considering life and death and despair and joy all in the course of three-and-a-half minutes and I want it now, now now now.